Hexproof v. can't be the target of spells? Multiple privileged positions and hexproof-blindspot? Don't know what kind of budget you have but adding Privileged Position and/or Aura Shards might be good includes. Finest Hour is probably better than Brave the Sands, so if we're trying to fit in Leyline of Anticipation and Privileged Position , it would be better to cut that instead. And it would probably be correct to cut New Horizons instead of Weirding Wood. A card is better than a +1/+1 counter. 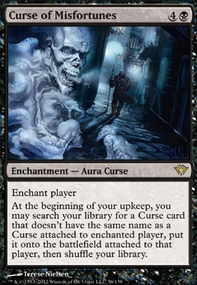 You're going to want to add Alchemist's Refuge to the manabase to help you cast enchantments on your opponent's turns when you don't have Leyline of Anticipation. It might even be worth trying to play Vedalken Orrery to get these effects more often. 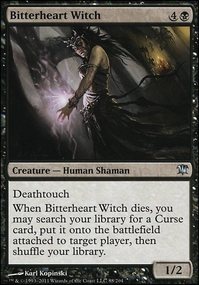 There are a few flash enchantments you can play as well: Seal Away , Temporal Isolation , Slow Motion , Lawmage's Binding , Cast Out , Alexi's Cloak , Cho-Manno's Blessing , Eel Umbra , Jolrael's Favor , and Serpent Skin seem playable. Another thing you might consider are replayable enchantments. The few I'm thinking of are Mana Bloom , Gossamer Chains , Flickering Ward , Broken Fall and Molting Skin . The latter three will also help you keep Tuvasa alive! Speaking of keeping your commander alive, you might find it difficult with only Shield of the Oversoul, Swiftfoot Boots, Lightning Greaves, and Greater Auramancy. 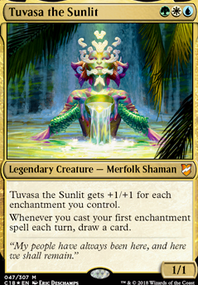 Furthermore, the latter two give shroud, which will make it hard to enchant Tuvasa afterwards! I'd consider trying to find more hexproof and indestructible effects even if they come from non-enchantment sources, such as Darksteel Plate . As for auras, there's Alpha Authority and Canopy Cover . Finally, as just a neat card, you might consider playing Cloud Cover . As for things to take out, the first thing I would do is take out Luminarch Ascension. The card is so powerful that people will just kill it or, more likely, YOU. It's a political disaster. I'd pull Abundant Growth because it's just not a very high-yield card. 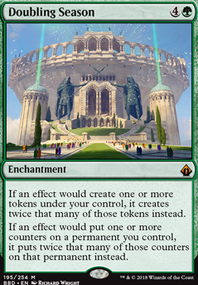 If you're looking for ramp and color-fixing, Carpet of Flowers is better because of how common blue is in Commander. 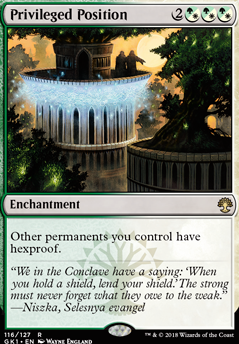 Authority of the Consuls is probably not going to be very useful unless you know opponents are going to making large numbers of 1/1s for a combo. Finally, as much as I like it as a card, On Serra's Wings is not particularly excellent here. Unfortunately, that's just four cuts, and I gave a lot more suggestions. You'll just have to consider what effects you might want enough to include. Matsu-Tribe Decoy is perfect! The tap effect is a nice touch. At 4 mana, I'm not sure if there will be room in the deck for the elephants. Privileged Position is the perfect type of card, but the price is a little out of reach for this deck at the moment. And Privileged Position for added protection. Thank you for your comment and suggestions. 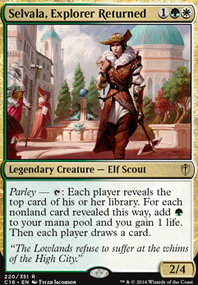 I had Tuskguard Captain but she was replaced with Bramblewood Paragon which has the same affect for 1 colourless mana less and all I had to give up was -1 toughness. I have ways of protecting my board with Privileged Position , Heroic Intervention and Teferi's Protection . If my stuff does go to the graveyard I have Muldrotha, the Gravetide , Eternal Witness and Volrath's Stronghold to bring stuff back. I've fallen in to the habit in the past where I built a deck to do something but spent more time on ways to protect and recur it rather then build it to do the stuff it was meant to do. Wooded Bastion does not create green mana on turn 1, which is when you need green mana. You want Temple Garden instead, which can also be fetched by Windswept Heath . Be aware that Hushwing Gryff is a nonbo with Iona, Shield of Emeria . Gilded Lotus is too slow to really be good, I think, and you don't need the mana fixing from it. Oblivion Ring is slightly better than Banishing Light since it actually exiles the target permanent, even if they have enchantment removal ready, so you can use it to get rid of tokens and auras on the target. I don't like Light from Within , you want to cast an angel with 4 mana, not an enchantment. Leyline of Sanctity is more commonly a sideboard card, and Privileged Position is only really good if you play in a meta with a lot of spot-removal. 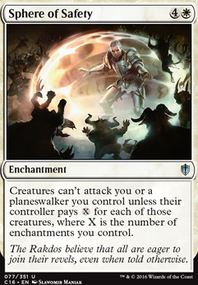 Path to Exile on the other hand is an excellent removal card that I think you'd want in the mainboard rather than the side. killroy726 sorry buddie but Queen Marchesa ain't grixis but mardu . But Privileged Position Still needs to be droped.